A chemical plant was experiencing excessive noise which in turn was causing numerous problems with plant neighbors. Working with plant personnel, SAS modeled the system and as an urgent first task, corrected the flow distribution problems. Follow-on analysis indicated that the reactor itself was producing the noise via a Riejke-tube phenomenon. Instead of an expensive reactor redesign, SAS recommended the installation of a Helmholtz resonator in the exhaust stack – tuned to the frequency of the rector noise. SAS accomplished the design and fabrication of the stack replacement and was on-site to oversee the installation. 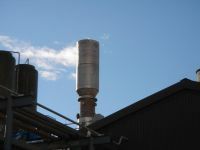 At start-up, noise levels were reduced by over 20 dB – and concerns from plant neighbors were eliminated.